The final text of the Abidjan Principles on the human rights obligations of States to provide public education and to regulate private involvement in education was published on Thursday 21st March 2019, with a press conference at The Heron Portico Hotel in Nairobi, Kenya. RTE's Director was there with other members of the secretariat and responded to the questions from the audience, including journalists, members of the Kenyan Ministry of Education, civil society organisations, teachers unions, parents and members of the communities. The Abidjan Principles is a new landmark reference point in terms of understanding the right to education. Providing crucial guidance to governments, education providers, human rights practitioners, scholars and other stakeholders, the Principles are intended to directly inform education policies. They identify and unpack the existing obligations of states under international human rights law to provide quality public education and to regulate private involvement in education. The Abidjan Principles constitute a milestone to address the raging debates about public and private education, following the significant increase in private schools that has taken place in the last two decades. By providing a rigorous legal framework detailing States’ existing legal binding obligations, they will help to ensure that the discussion on education policies put the right to education as their core. The Abidjan Principles are being released following their adoption by human rights experts in Abidjan, Côte d’Ivoire. On 13 February 2019, following three years of consultations, documentation and drafting, human rights experts from around the world came together to discuss and finalise the text of the Abidjan Principles, in the presence of the Minister of Education of Côte d’Ivoire, Ms Kandia Camara. The Abidjan Principles will later be accompanied by commentary and key resources and translated into other languages. The drafting of the Abidjan Principles was led by a drafting committee made up of nine internationally-renowned experts. Another 15 experts who were present in Abidjan are signatories to the text, and dozens more leading human rights experts who participated to its elaboration are expected to sign the text in the coming weeks. A secretariat made up of Amnesty International, the Equal Education Law Centre, the Global Initiative for Economic, Social, and Cultural Rights, the Initiative for Social and Economic Rights, and the Right to Education Initiative facilitated the consultative process. After their publication, the Abidjan Principles will also be open for endorsements from civil society organisations and other stakeholders. A series of launch events and presentations on the Abidjan Principles are scheduled throughout 2019. The next events will include a panel at the World Bank Spring Meetings on 11 April in Washington, D.C., USA, as well as presentations at the Comparative and International Education Society conference on 16 April in San Francisco, USA. More international events will be announced. 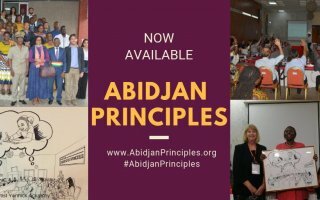 For more information and to be notified, please sign up to the Abidjan Principles mailing list: http://eepurl.com/geUlLb. Right to Education Initiative ©2018. All rights reserved.